I was getting stuff together to visit family this holiday and last minute I received an email from my brother with a picture of a bunch of Lego minis arranged as shown entitled “My Army Awaits”. His kids are still very young, and since he’s running after them all the time I didn’t think he’d want to lug his Warhammer Fantasy Battle army out or have time to play, but his picture was the perfect catalyst for a kid friendly version. 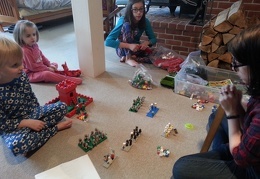 While we were hanging out I threw together an impromptu fantasy battle game with the kids using Lego. This was to be a short and fast game, comparable to what might be less than 1000 points of units in a real game. The rules were a watered down Warhammer Fantasy Battle which I refereed and interpereted as questions arose. I let the kids put together the respective "armies" and then came up with these rules on the spot as we were playing. The armies, which were roughly equal, were allowed a couple of special units. On one side were the Vikings (this was predetermined by my brother’s earlier work with his 6yo son creating that army) who emerged from their Keep to discover that they were under siege by 1980's era Space Guys (run by my high school age daughter). All rolls are d6 unless specifically noted. 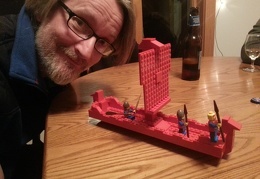 The Vikings had a secret weapon - a Viking ship which could materialize only once in the game anywhere on the board to deliver four explosive charges (each with the area of effect of a small see-through flourescent green Lego radio dish which could usually catch 2 or 3 lego minis at a time) and which hit on a 4,5, or 6. The ship would then dematerialize into the ether again. They also had a unit of six Giants (larger Playmobile guys) who could lob boulders (represented by a pile of yellow lego heads) that would smash through as many Space Guy enemies as possible in a direct line on a 5 or 6 (a miss would stop the boulder). The Giants could either fire or move independently (they didn’t have to stay together as a unit). The regular Vikings were armed with sword and shield and hit on a 5 or 6. All the Vikings could move 4" (we used a big 18” ruler). The 1980s Space Guys had some tricks up their sleeves as well. One group (the guys in white space suits) could fire laser guns, even in close combat but got no save while in close combat (so if they were hit in combat, they would just be removed). Another group, the 6 black space suited guys, were suicide bombers rigged to explode when they got into combat range with the same effects as the Viking’s explosive charges above. There was one Space Guy on a horse we called the Space Cowboy. Any group that was accompanied by the Space Cowboy could move 6", while normal Space Guys could move only 3". The Space Guys had communications systems and were in contact with a space ship in orbit that they could call to escape if things got too rough. Unfortunately only the Space Cowboy had a long range radio, so if they were to lose him, they'd have to depend on the weaker radios in their helmets. These helmets could only be heard by the mothership on an 18,19, or 20 of a d20 roll. There were 29 Vikings arrayed against 35 Space Guys so I made the Space Guys a little slower with less potent long range weaponry. I was very lax with movement - units could "wheel" freely, and turn any which way necessary. When formed units came in contact, that was called "close combat" and only the guys reasonably near to each other on each side could fight each other. The Giants could move independently and wander all over the board. If there was only one guy left in a formed unit they would “break” on a 1,2, or 3 - turning 180 degrees around and running off at their max move. In hand to hand combat when an individual guy was hit (except for laser weapon units) they got to roll a "save" which would allow them to avoid dying if they rolled a 5 or a 6. The whole game took under an hour and was played to the last two Space Guys who were not rescued in time.